DWF - The Digital Watch Forum • View topic - Pulsar P2 Spring bar? I wanted to add another link in my P2 bracelet. I have the link but not the spring loaded pin. Measurements seem to be 10mm wide (14mm inc sprung sections) and about 1 to 1.2 mm wide. Looking around at modern spring bars, they all seem to have the ribbed shoulders (extra rings on the sprung ends), which I don't think will work with the P2 bracelet? Short of buying a standard one and filing off the extra shoulders, what options do I have? I see there are universal spring bars, which look to be perfect, but the ones I can see are 1.8 mm diameter (too big). Re: Pulsar P2 Spring bar? You might try pulling a pin out of another link, and taking it, as a sample, to local watch and jewelry-repair shops. If they'e been around a long time, I assure you, they have accumulated a box of assorted springbars. As long as you have a physical example of exactly what you're looking for, there's a good chance they'll find what you need. I have done this a few times, myself, and have never failed to find something usable. Cheers Bruce. I should have mentioned I have already tried that. I don't live in the city anymore. The town where I now live has 3 watch jewelers. All of them shrugged thier shoulders when I showed them ghe spring bar. I have order some modern ribbed spring bars. I will attempt to file them down when they arrive. I also have some leather p2 straps on thier way to me, so I will probably shelve the ss strap for a while. Since I repair and restore plenty of 1970’s watches – many of which featuring defunct band widths such as 19mm – I have also encountered this issue in my endeavors. It is important to note that there exist 2 types of spring bar pins: those with ribs designed for attaching the band to the case, and those without used to attach the band to the clasp or to add another link on some bands. The ribs on the former are designed to allow a forked tool to grab onto the pin since the ends are shrouded. The non-ribbed spring pins are usually sold on e-bay in a set of assorted sizes. If you are unable to salvage one from a junk band, sometimes it is necessary to purchase an entire set just to obtain that one odd pin. Of course filing the ends would work also, though use caution to avoid bending the fragile tips. I found one (with small ribs) that fitted. It came from a set of 50 from eBay. I then came across a junk band and used one of the pins from that as I wasn't that confident with the one from the eBay set. Thanks for your reply. It's good to know I am not the only one that has trouble getting them. I visited several vintage watch shops in London and none of them could help. At least there are other options. cte wrote: Thank you Jason. It's great to hear that you were able to salvage a pin from a junk band! This is why it pays to keep a box of vintage parts. 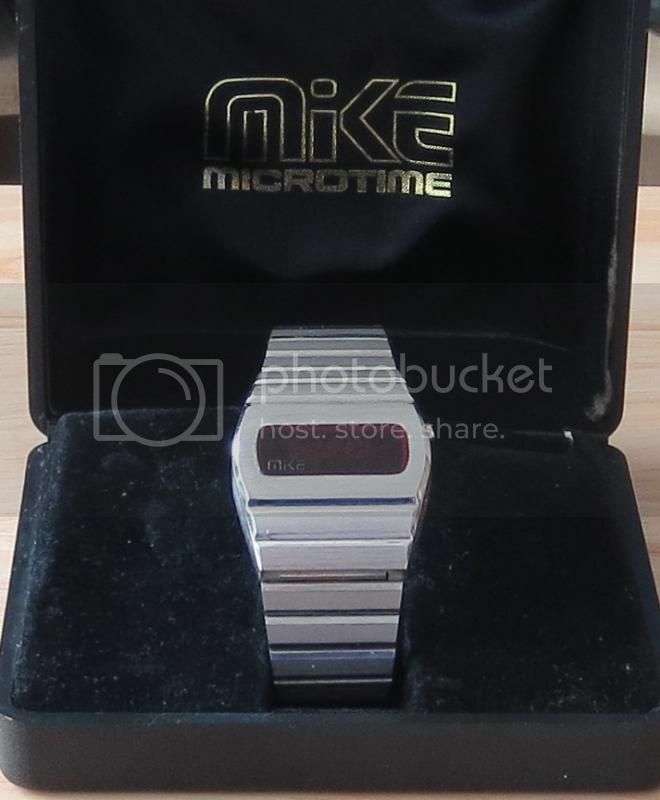 I own a beautiful condition mid '70s LED watch that I've never worn because the no longer made 19mm width band was too small for me. 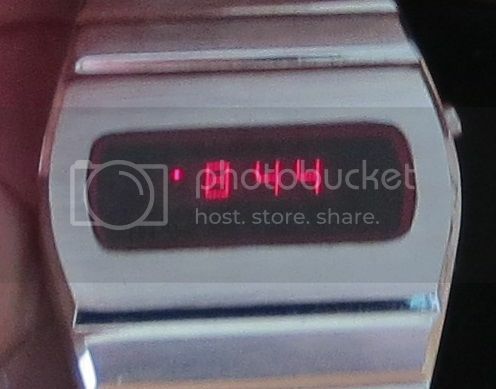 After taking some measurements, I learned that the removable links on a common sized 20mm width mid '70s LED watch band were made by the same company and exactly the same. I just added 3 links from the junk band and now it fits me like a glove and retains the original band that's well suited to the case. Really nice. I'm glad you are able to wear this beauty now also. It's so frustrating having a watch, with the correct number of links, but not the correct number of fitting spring bars lol!